Colors in blue represent stocks where holdings have gone up and in red represent stocks where holdings have gone down. · One of the smartest investors in India believes in the benefits of portfolio concentration. His top 5 holdings account for 58.39% of his portfolio and his top 10 holdings account for almost 83.80% of his portfolio. · In the recent stock market crash this portfolio has seen a notional loss of around 45%. So like all normal investors the bigger ones also lose money in their quest for wealth the difference being that while ordinary normal investors exit the markets the bigger ones keep looking for opportunities. 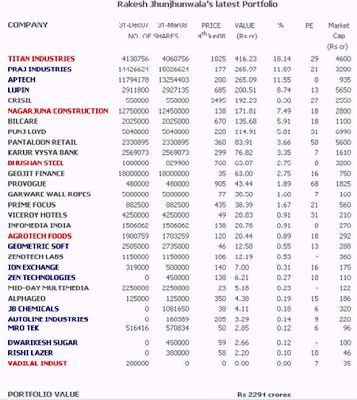 Some stocks like Titan, Nagarjuna Construction, Pantaloon and Praj have lost anywhere between 40% to 50% from their highs! This portfolio has the latest market cap and the Price to earnings ratio as spruced from money control. The average weighted market cap of the portfolio is Rs 3105 crores only whereas the average Price Earnings ratio adjusted for the companies that have no earnings is around 30 times! But most of these smaller capitalized companies with earnings visibility and a big moat. · It is very hard to find a cyclical or commodity stock in his portfolio. · Unlike the general investor none of these stocks are large caps in the true sense of the definition. Of Course he could be holding future positions in large caps but the point that I am trying to make is money is made in small and mid caps only. The notional losses that an investor can suffer are also the highest in these stocks. It is very important for an investor not to convert these notional losses in actual losses by selling the shares in despair. · Most of these stocks are being held for over 3 years. Companies like Titan, Pantaloon Retail fall in that category. Others like Crisil are being held for more then 5 years and some for even as long as 10 years. – Clearly Time and not timing is the key to these markets. · Almost all these companies are looking at a huge external scale of opportunity whether it is a Titan or a Pantaloon a Nagarjuna Construction or Lupin the sheer size of the addressable market is humongous. – Morale of the story “See the Bigger Picture”. · Rakesh has a special corner for companies that are engaged in consumer, infrastructure and pharmaceutical space. Otherwise he is betting on rising crude prices by buying stocks like Hindustan oil exploration and Praj Industries The overall portfolio is well diversified except that he is not holding any metal or cyclical stocks. · These shares are held by Rakesh and his wife Rekha Jhunjhunwala and form a part of his disclosed portfolio. He could be holding more shares through companies, trusts, proprietary accounts which are not in the public domain. Equity investment should always be done cautiously. Though Financial markets (especially stocks trading) looks lucrative, if one fails to understand the finance, better you leave it to stock market experts (Mutual Funds, portfolio management etc.) Invest Wisely,Trade Cautiously !! Happy investing ! !